The Stone Cherry Packing House pilot model. The Stone Cherry Packing House is now available! 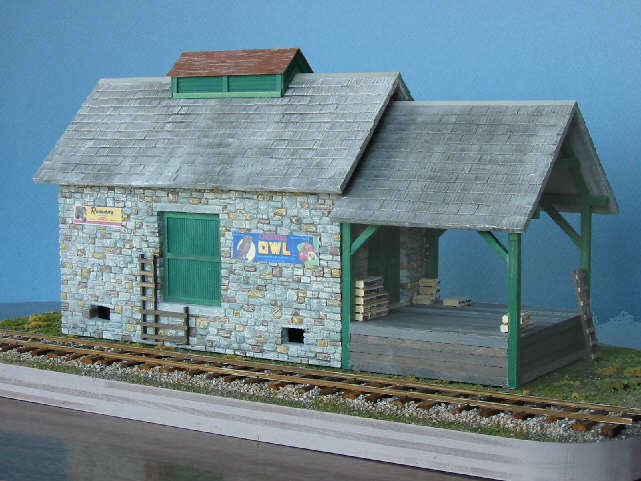 It is my second limited run O-scale structure kit. The kit features my own highly detailed hand-scribed stone walls cast in White Hydrocal. This isn't something I just scribbled together. No, I spent hours and hours making them look just right, cutting the openings, scribing the details, and making them fit just right too. It goes together easily to make a unique line side industry you'll be happy to drop cars off at. Perhaps the best part of the model is the hand-split cedar shake roof, also cast in White Hydrocal. You get all the detail of the hand-layed origninals (yes, I actually hand-split Western Red Cedar for the master!) but without the fuss (I nearly went NUTS! So you don't have to.) All we have to do now is color them and that's a snap with a simple ink wash and some watercolors. There's also an attached covered sorting platform covered with board-by-board lumber and more of the cedar shake roof. To complete the details there's a colorful printout of authentic cherry crate end label art and instructions for building several dozen scale cherry crates. Of course you are free to employ your model in any other sort of line-side industry you can think of- it doesn't have to be cherries or fruit. The kit comes with seven pages of complete step-by-step instructions with full-size templates. 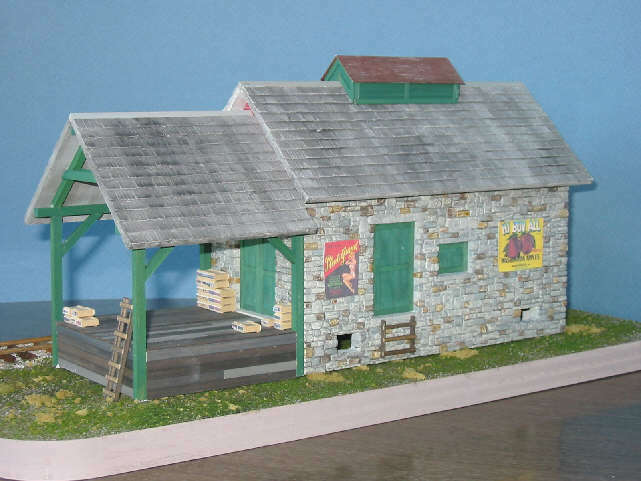 The single story structure is approximately 4" wide and 12-1/4" long in O-scale. Just perfect for that small spot you've been wondering what to do with. The Stone Cherry Packing House will be a limited run of only 125 kits. Order yours today! Please add $10.00 for shipping of this model. The cedar shake roofing is cast Hydrocal so constrcution is a breeze!